The Ordinary Life of an Extraordinary Girl: A book give-away! I often write about how we are all unique, yet so often surprisingly the same. 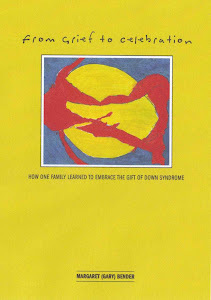 Fellow blogger and author Gary Bender put her experiences into print (and Kindle(r)) with the short memoir, From Grief to Celebration: How One Family Learned to Embrace the Gift of Down Syndrome. 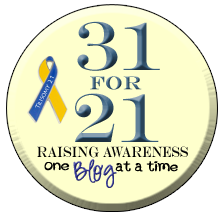 As part of DSAM2103 Blog Like Crazy Month! I included a short review. If you follow Gary’s blog, you’ve watched her family take the courageous step to encourage and facilitate her daughter Alex (who has Down syndrome) to go away to college. Go – Away – To – College! Gary’s family is a great example of not making assumptions about her daughter’s future based exclusively on her disabilities but rather on her abilities. I was able to soothe a coworker recently with this truth when her sister gave birth to a beautiful girl with Down syndrome. The opportunities and possibilities are ever growing for children of widely varied abilities. In her book, Gary not only shares her experience but also many resources. She is honest with the moments of frustration and sorrow and also honest with her hope for the future. She is an advocate for understanding. Would you or someone you know benefit from Gary Bender’s information and experience? If so, good news! You can win a chance at her book right here – right now! Thanks Mardra - I love getting out the word about my book!